Though perhaps unknown to those outside the world of chainsaws and power tools, the Poulan brand name has a long history of a quality and innovation. For more than 100 years, the name Poulan has been associated with quality and affordability. We hope that you will find our review of the Poulan Pro PP5020AV helpful. A powerful 20-inch chainsaw is at the top end of what most homeowners would ever need and probably for many, the biggest they could comfortably handle. These saws can tackle the heavy-duty stuff you might need to do including light or heavy clean up tasks after a storm and other demanding jobs. Some of these models would even be rugged enough for a professional to use every day so they are certainly capable machines, so let's see if we can find the best homeowner chainsaw! The Husky 450 Chainsaw is a great choice for the homeowner looking for a powerful, quality saw that can handle everything you’re likely to throw at it. It’s designed for the more casual user but still comes with enough power and a robust build to make it suitable for lighter use by a professional. We hope that you find our Husqvarna 450 Rancher chainsaw review helpful. The NATI Blue Max brand is possibly not one of the most well-known when it comes to chainsaws, but with over 50 years of experience in the tools business, they are certainly worth considering. NATI is the shortened name of North American Tool Industries, who own several other brands besides Blue Max in the professional and home user market, including Yard Dog, Professional Woodworker and Speedway Pro. Whether you’re shopping for your first leaf blower, or perhaps thinking of upgrading your current underpowered machine, then you need to take a good look at the ones from Husqvarna. Their range of gas powered leaf blowers are very popular and for good reason. Powerful and reliable, there is one to suit everyone, however big your leaf clearing job is. But with around 15 models to choose from at the time of writing, you may well be scratching your head wondering which one is best for you. That’s where we can help. Most home owners and flat dwellers own tools, if only a hammer for hanging pictures or a drill and screwdriver for mounting a towel rail. But these few implements, however useful they are, hardly comprise a comprehensive tool kit for home repair and improvement. On the other hand, there is hardly any project, not even the erection of an entire house, that needs every tool that can be found in a hardware shop. Many of the items sold there are for rarely encountered contingencies; others may be gadgets of dubious value. The Poulan and Poulan Pro brands have been around since 1944, supplying a range of outdoor power tools and machinery. Their ethos is to provide durable, powerful, quality machines to the homeowner at a price that reflects great value. Poulan take the best engines and base machines from other manufacturers and build their own models with a distinctive look. They supply these to consumers making sure the features and pricing are always competitive in the marketplace. Briggs and Stratton have been making engines and power equipment for more than 100 years so they know a thing or two about building durable machines. Their 950 series of two-stage snow blowers are perfect for tackling small to medium driveways and paths. 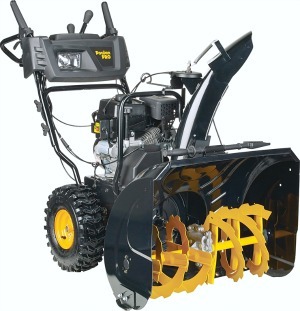 The 1696610 model is the entry level 2-stage machine and is marketed as being able to handle light to medium snowfall. Husqvarna has been making quality power tools for the garden and forest since the 1950s and their range of snow blowers cater for all types of use. The ST224P is the mid-range model in their high performing set of ST200 snow blowers. These are aimed at the typical homeowner with a large driveway and several pathways to clear. Choosing the right two-stage snow blower (also known as snow throwers) is a daunting task these days. There are just so many to choose from! To help you out, we have selected what we think are four of the best 2-stage snow throwers on the market today that can handle moderate to heavy snowfall.